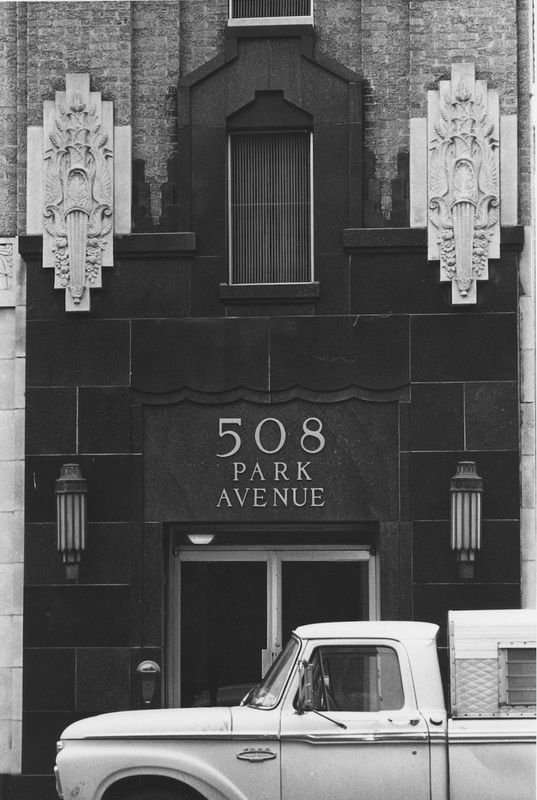 508 Park was designed by the New Orleans architects Weiss, Dreyfous, and Seiferth. The firm is known for designing the Louisiana State Capitol in Baton Rouge, as well as several structures on the campus of Louisiana State University. 508 Park is both distinctive and utilitarian in its original design. The Zigzag Moderne Art Deco facade includes custom cast-stone reliefs of Greek mythology figures and black Belgian marble. The original interior included elements that hinted at its Hollywood connection but was truly designed to meet the demands of the motion picture industry and local ordinances regarding the handling and storage of highly-combustible silver nitrate films. The front of the building is classic Zigzag Moderne style. Vertical lines are protruding while the horizontal lines are recessed giving an extended sense of height. The front stairwell which leads up to the roof top movie screening room is formed into a “tower” structure. The god head relief at the top of the stairwell “tower” we believe is Zephyrus, god of the west wind who represents the gentlest of the four winds and is the messenger of spring. The cast stone motifs contain birds, small animals and flowers reminiscent of spring. On either side of and above the main entrance are vertically oriented cornucopias filled with spring’s bounty. Learn more about the three movements of Art Deco style here. The first floor facade is predominantly cast stone panels and black marble surround for the main entrance to the elevator lobby at the base of the “tower.” A secondary entry to the front of the first floor was located in the center of the cast stone. The upper floors are primarily cream colored brick with cast stone accents and a stepped parapet at the roof line. On the south face of the building there is a vertical area of red brick surrounded by a border of cream brick. The mortar joint work in this area is flush with the brick in this area where the rest of the building is pointed concave. We believe this area was used for pasting to the side of the building large advertising movie posters of the latest Warner Brother releases. The original interior included elements that hinted at its Hollywood connection but was truly designed to meet the demands of the motion picture industry and local ordinances regarding the handling and storage of highly-combustible films. The lobby which will be restored includes a black and white zigzag patterned marble floor and “aluminum-bronze” colored walls. Two cast iron air vents echo the cast stone motifs on the front of the building. 508 Park’s skylights for one of the two film inspection areas on the first floor were operable and oriented in a manner that used the second and third floor niche on the south side of the building to maximize natural (passive) ventilation of the warehouse/film vault area. Air entering the first floor through the skylights would pass through the film vaults during operations when the vault doors were open. Each of the sixteen film vaults had its own chimney that allowed the fresh air and film gasses to exhaust through the top of the building above the roof level. The first floor was designed with a large central area for moving films into and out of the vaults. The vaults were organized in two banks. Twelve on the north side and 4 on the south side with the restrooms, a freight elevator and truck dock access. At either end were film inspection areas with windows and skylights. There is basement under the back (east) half of the building and provided access to the floor drains which were present in each film vault on the first floor. The basement also contained the boiler for heating the building and a restroom. The second floor is not as tall as the first-floor warehouse as it was planned for offices or to be for offices. The third floor, being taller than the second, may have been intended to be a flexible space for offices or warehouse or both which it ended up being after Warner Brothers purchased the record business. The roof top level has both of the elevator equipment rooms. Only the front stairs access the roof level. This level also has a fireproofed film projection room with a small film vault and a toilet for the operator. The adjoining screening/audience room would have accommodated about 30 people. Early in our research we found a picture of an architectural rendering of how the original front of the building was designed. This was found at the Dallas Public Library in the January 9, 1930 edition of the Daily Times-Herald (Dallas) newspaper. We found the picture below from the 1940s at the Jack Warner Archives at The University of Southern California in a file showing the taxable values of Warner Brother property. 508 Park is on the right and the Lone Star Radiator Repair building to the left. This picture allowed us to identify the “VITAPHONE” lettering on the side of the roof top film screening room. That lettering was too vague to be identified on site at the time we acquired the building. Also note the difference in the first floor windows from the original façade in the picture above. We found a letter in the archive indicating that the print shop was moved from the basement to the first floor at some point. We believe the windows were enlarged and the ventilation valances added at that time. We were fortunate to find a copy of the building specification book “Specifications For A Three Story, Reinforced Concrete Film Exchange Building To Be Erected On Park Avenue, near Young Street, Dallas, Texas,” at the Southeastern Architectural Archive at the Howard-Tilton Memorial Library at Tulane University. The following paragraph helped us to determine that Warner Brothers had their name above the door originally where the “508 PARK AVE” is currently. We believe that Glazer’s placed the street address on the building at the time they moved into the building. We learned that a “designed marble floor” had existed in the lobby which we later found under several inches of concrete. We learned that the small restroom in the “cellar” (basement) was intended to be the “Colored” toilet. This bathroom will be preserved as a future historical exhibit. We read that the two rooms on the roof were a projection and screening theater. The specifications indicated that the theater was to be much larger than what was constructed, possibly related to the stock market crash and economic conditions in 1930 or construction budget constraints. At the time we acquired the building the sconces on either side of the main entry had been removed from the building. We had found the black and white photograph shown below (left) at the Dallas Public Library. After much searching for someone who might reproduce the sconces, we were introduced to a Dallas metal working studio which was owned by Richard Potter, grandson of the founder. Richard said he believed the sconces had been designed by his grandfather. We commissioned Potter Art Metal Studios in 2014 to recreate the art deco sconces that had once adorned the building. A preliminary design drawing by Izabela Wojcik of Potter Art Metal Studios during 2012 (center). Sconces being crafted (right). Phoenix 1 Restoration and Construction, LTD / Dale Sellers – 508 Park exterior restoration. Phoenix 1 has achieved many historic building restorations in the Texas area including many Texas county courthouses.